Meet the teens who are making people realise they can bring about change in their local community. YOUNG PEOPLE CAN get a bad rap sometimes, accused of spending too much time on social media and not enough engaging in the world around them. But people who criticise teenagers might not be aware of the many youths who have their mindset on improving the community they live in. This April, the Foróige Youth Citizenship Awards will see thousands of young people from across Ireland showing off what they’ve done to help in their community. Last year, the overall winning group launched a life-saving defibrillator scheme, which saw tens of locals learning how to use the machines. 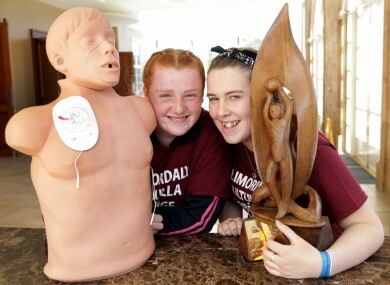 Killimordaly Kiltullagh Foróige Club in Co Galway used the awards as a chance to look at how defibrillators were used in their community, and realised that the batteries had run out and there was a lack of knowledge around how to use them. To help, they brought in trainers to train people in the community on the use of defibrillators; produced a laminated leaflet on who was trained for every fridge in the community; and raised a huge amount of money to replace expensive batteries and buy containers for the defibrillators. They also learned how to use the defibrillators themselves. Lauren Lewis (16) was part of the group, and told TheJournal.ie that she and her friends felt it important to focus on something that would benefit their hometown. She joined Foróige four years ago thanks to the mother of a friend of hers, who is a long-term Foróige leader. For teens like Lewis, who live miles from their friends and even further from the nearest town, the Foróige club is a lifeline, she said. They talk, play games, and chat about how their week has been going. “It is a very big community,” she said. It’s a place where you don’t have to worry. Foróige, it fits everyone, there is no judging of everyone. It was during a chat that they came up with the idea to focus their citizenship awards entry on defibrillators. “We asked them ‘who here knows how to use a defibrillator?’ and only myself and Rebecca put our hands up,” she recalled. Lewis is a trained lifeguard and trained first aid responder through the Order of Malta. Her long-term aim is to become a paramedic. So she knew first-hand how important and life-saving defibrillators can be. She also knew who could help with training. The project began with getting the Athenry first responders to come out for training. Word spread and the local hurling club and vintage club got in touch to ask if they could be next. “We got a lot of people saying how it’s a great idea and how brave we were to take part in it,” said Lewis. Now there are 50 – 60 people in the Foróige club alone trained up in using the defibrillators. There are four defibrillators in the local parish. Underneath each one the group placed a list of people who live nearby and are qualified to use the defibrillator, the West Doc contact number, and the name of a local nurse. It had a very big impact because the whole reason this came about as well was because there was a lady who did have a heart attack, and the defibrillator was brought and it wasn’t used because she didn’t need it, there was nothing we could have done. But when we all heard it we thought ‘now is the time for us to act on it’. The woman’s family later contacted the Foróige members “to say how thoughtful we were and appreciative they were”. Sean Campbell is CEO of Foróige and said that the awards “empower young people around Ireland to make positive change in the world”. “It is so inspiring to see what young people can achieve when they work together and put their minds to something,” he said. He said that the awards also give people visibility in their local community, while showing them “at their best”. He agreed with Lewis that teenagers are capable of much more than people sometimes realise. “Very rarely do you get really good news stories about young people,” he said. “This is normal, this is what normal Ireland is, this is young people from every walk of life – urban, rural, advantaged, disadvantaged, communities right across the spectrum,” he said of the youth citizenship participants. It shows that if you take an interest in young people and give them the support, give them the encouragement… they are by nature idealistic and enthusiastic and when you can bring that together you bring an enormous energy change. This year’s Foróige Citizenship Awards, sponsored by Aldi, will take place on 29 April in Citywest Hotel and Conference Centre, Dublin. Two thousand young people from throughout Ireland will travel to showcase their project in the community. Email “Inspiring teens: 'Very rarely do you get really good news stories about young people' ”. Feedback on “Inspiring teens: 'Very rarely do you get really good news stories about young people' ”.